If you are regular reader you might know that we moved recently. I'm currently working on setting up my new craft space. The shelf I was using to store craft supplies is now being used to store my clothes and I no more have the big table, metallic thumb tack wall art, inspiration board, ribbon organizer, etc. So I have to start from the scratch to build a craft space and the area I have now is very small compared to the one I had before but I am happy that I have an area dedicated entirely to my crafts and no other household item is sharing the space this time. So I had to come up with a solution to organize all my supplies as well as make my craft space, an inspiring space to work. I had a lot of craft supplies that are just sitting idle inside my supply boxes for many years and I needed a way to display them so that I know they are there and also I can come up with an idea to use them. (Kind of an inspiration board with unused craft supplies) So, I decided to install pegboard to display and organize them. I came up with this post as I struggled a lot to find the exact things I need to build this pegboard.I am sharing this to make it easy for you if you decide to install a pegboard too. 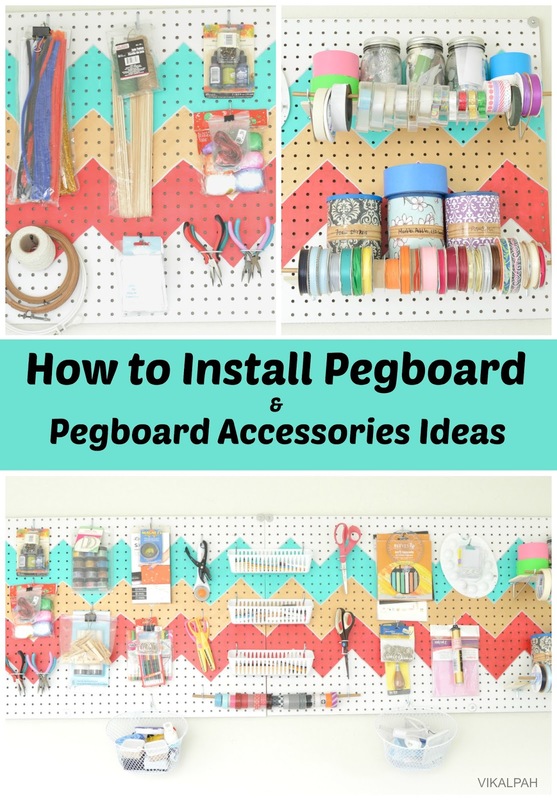 When I decided I want pegboard for my craft space I started to search for how-to's about pegboard installation and what kind of pegboard to get,etc. 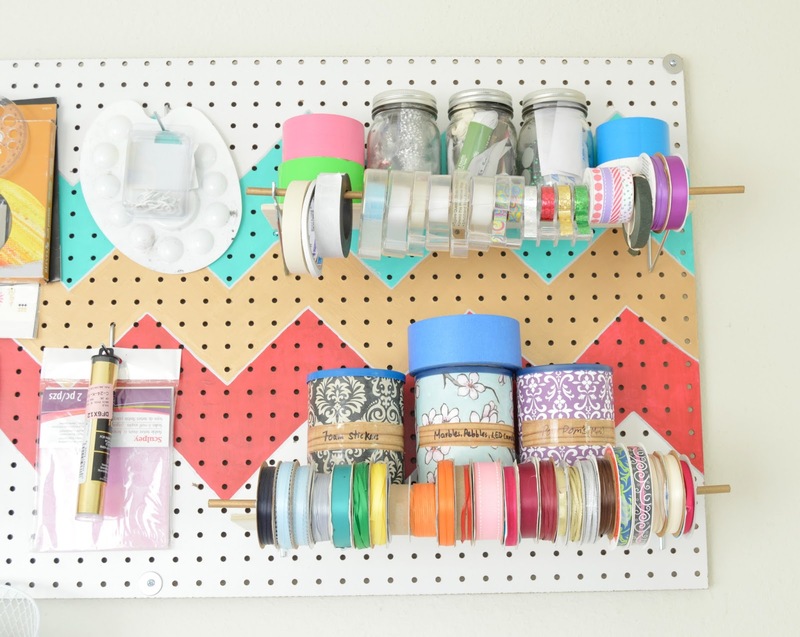 Most of the websites suggested to get a pegboard with 1/4" or 1/2" hole because it is difficult to find accessories for 3/16" hole. I went to home depot & Lowe's and asked for pegboard with 1/4" or 1/2" hole, they only had 3/16" hole 2ft x 4ft pegboard in white(Home depot)and lowe's only had 4ft x 8ft 3/16" hole in brown, then I came home and searched for it in amazon. The results shows a lot of things but nothing in the color and size you want and also the price tag is crazy. I mean $56 for two pegboards when you can get it for $15(for 3/16" hole) in home depot.No way! Finally I decided to settle for two 3/16" hole pegboard and went to the accessories section to find that none of the accessories says "for 3/16" hole"(As said earlier in many of the websites) but they had accessories kit that "fits 1/4" or 1/2" hole". When you put the math it all makes sense, if it fits 1/2"(0.5) hole it should fit 3/16"(0.18) , right? (Thanks to hubby because I did not think in that angle at all). So I got a assortment of accessories kit which also had screws and spacers to install the pegboard.Now let's see how to install. Step 1: This is a optional step.As I am going to fill the wall space with pegboard instead of some colorful art, I don't wanted it to look plain.So I decided to paint the pegboard in my blog colors(Teal,pink and gold). To bring a balance, I used chevron pattern as I used the same in the bookshelves rim I am using for storing my craft supplies. Used masking tape(as I only had that in hand but I advice you to use painter's tape) to mask the design on the pegboard and used 2 to 3 coats of acrylic paint to paint the chevron pattern.I used enamel gold paint for the middle. 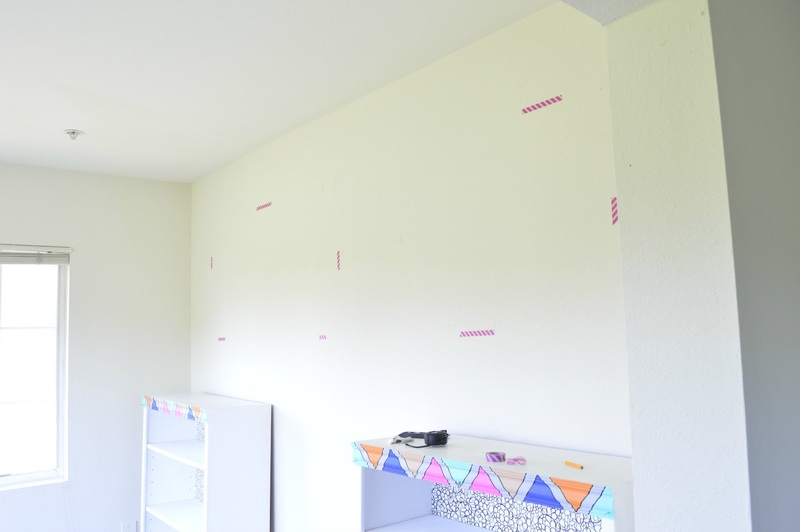 Step 2: Place the pegboard where you wanted to install and mark the outer areas with painter's tape and use a pencil to trace the holes where you want to drill. Step 3: Drill the holes in the wall, we used 3/16" drill bit. Then insert the drywall anchor into the wall. (The package said no drilling but we did drill the holes).Use hammer so that it fits nicely into the wall. Now take the screw insert it into the washer and then into the pegboard hole from the front. 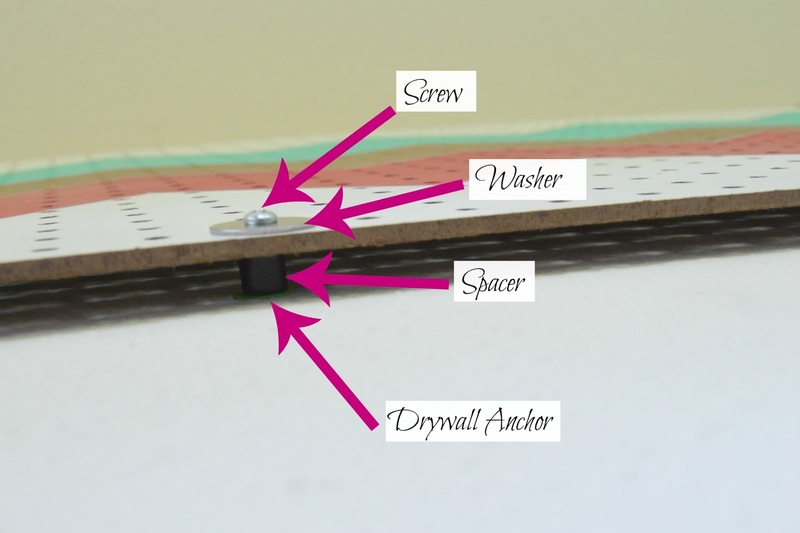 Then insert the spacer into the screw from the back of the pegboard. Now with some help lift the pegboard to the wall and fit the screws matching to the drywall anchors and use a screw driver to tighten the screw.That's it. You are done. I installed two 2ft X 4ft pegboards side by side for which I recommend six screws for each board (3 in the top and 3 in the bottom) totally 12 screws. 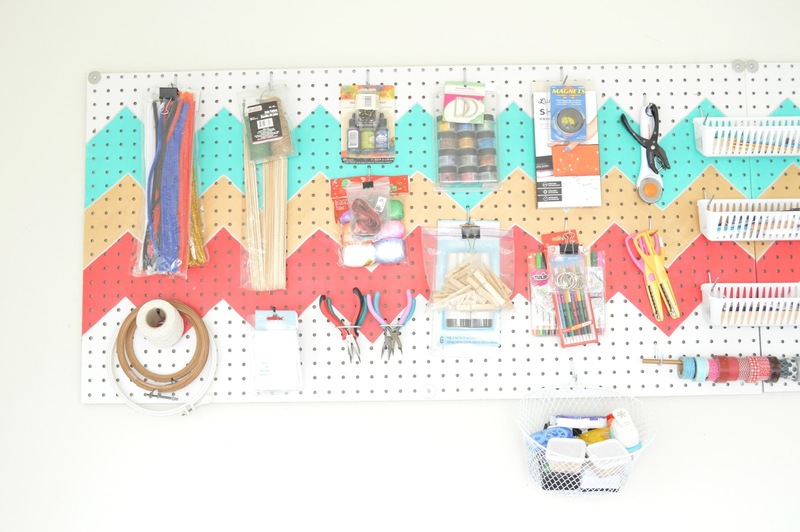 1) Try to keep your craft supplies in the package it comes as far as possible because the package will be designed to display on shelves in craft stores which are all pegboards so it will be easy for you to hang them in the hooks. 2) If you don't have them in package, use binder clips to hang them on hooks. 3) Use small long baskets for storing brushes, pens, pencils, etc. These baskets are 3 for $1 and it is the best deal you can get. I have used vertical space here to display these baskets but you can use these in the tiny space at the bottom. 4) Use wire baskets to store small items like stamps, stamp pads, punches, etc.These wire baskets are $1 each and it gives transparent look which allows you to easily identify what is inside. 5) Double the shelving space by using it as shelf as well as for ribbon storage. Instead of using a big wooden plank in the size of the shelving bracket, use a correct size of wooden plank as shelf and use the remaining area to store things like ribbons and tape on a wooden dowel. 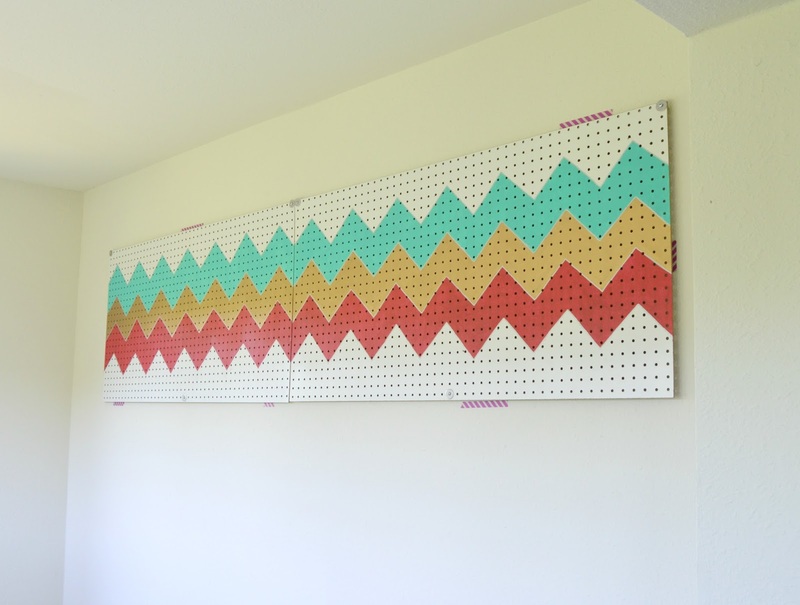 Here is the final complete look of the pegboard!! Hope this blog post helps you to get the complete insight of how to install a pegboard and also some accessories ideas. I am still playing with arrangement of items and if I come across more ideas I will update this post later. Let me know what you feel about this arrangement. 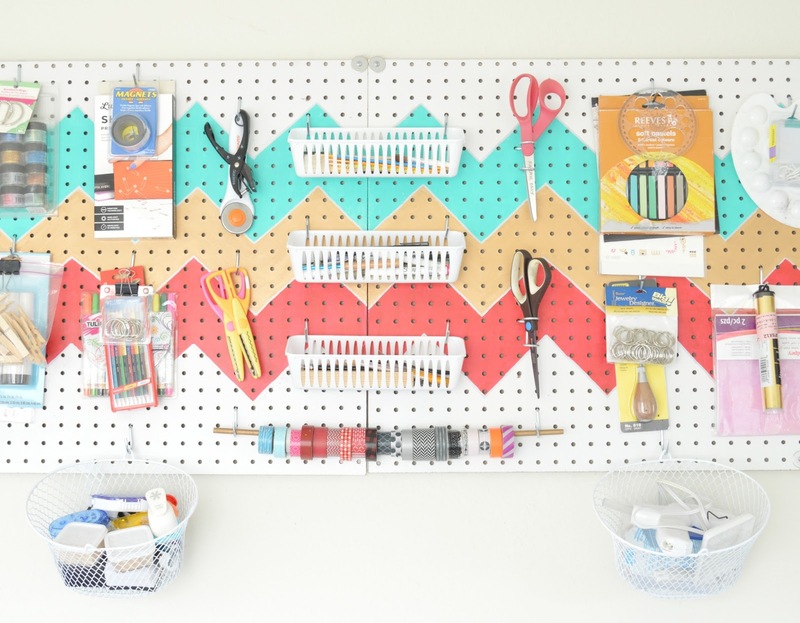 Have you installed pegboard before? Do you have any suggestions or clarifications? Share or ask them in the comments below. I will be happy to hear them. This is such a great idea. I love how you painted the board. Adds lots of personality. Your pegboard looks wonderful. I'm coming over from Merry Mondays. I helped an ex-boss install pegboard in a shop, but we just screwed it to some 2x4's on the wall with big, ugly screws. I've been wanting to use it to organize my office space, but I had no clue how to do it in a tasteful way... I'm not screwing 2x4's to my wall. Thanks for the tips! And I love the idea of painting it, too! What an adorable pegboard. It would have been boring but by painting that chevron pattern you too it to another level all together. Very pretty. Thank you fo sharing with us at Sweet Inspiration. Pinning this. I always love a splash of color! Not a fan of plain boring stuffs. Thank you for the opportunity to linkup. Love how bright and vibrant you've made your board. I'm sure it inspires tons of creativity! Thanks for sharing at Welcome Home Wednesdays! See you next week! I love the chevron design you put on your pegboard! I'm always up for pretty organization. Thanks for sharing with us at Merry Monday. This is a great way to keep everything organized and neat. I would love to have this in my office. I'm sure it would come in handy.